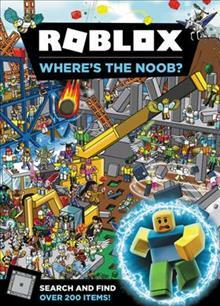 Embark on a search-and-find adventure with fan-favorite Roblox characters.Join Builderman, Ezebel: The Pirate Queen, Mr. Bling Bling, and other iconic characters as they journey through the imaginative worlds of Roblox on a quest to find the mischievous Classic Noob. There are ov... read full description below. Embark on a search-and-find adventure with fan-favorite Roblox characters.Join Builderman, Ezebel: The Pirate Queen, Mr. Bling Bling, and other iconic characters as they journey through the imaginative worlds of Roblox on a quest to find the mischievous Classic Noob. There are over a dozen intricately illustrated game worlds to experience, including the hustle and bustle of Theme Park Tycoon 2 and the gigantic realm of Hide and Seek Extreme, as well as hundreds of things to find along the way. Will you be able to discover the noob before he causes any more chaos?